International Watch Company or IWC Watches found its beginnings in the dream of Florentine Ariosto Jones, an American with a desire to build watches from American ingenuity and precise Swiss manufacturing. IWC opened a factory in east Switzerland and it remains watch manufacture in east Switzerland. IWC became renowned for inventing the first ever diver’s watch in 1969. 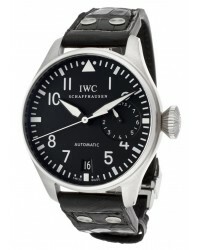 IWC luxury watches come with a simple classical touch and contemporary design that is the signature of IWC design. The IWC designer watches come in several collection and complications ranging from split minute chronographs to 7 day energy reserves. These fantastic watches are made from high quality materials, such as solid gold, sturdy stainless steel and articulately detailed leather.